It is almost a year to the day that I gave up my day job of setting up clinical trials of new drugs for hospital patients to pursue my dream of making felt full-time. A post on FB this week, prompted me to reflect on why I made that choice. 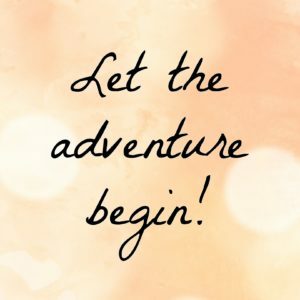 One year in to my new adventure and the start of a new year, this seems like a good place to pause and take stock. The post on FB asked us to choose the 3 main reasons why we chose to use our creative talents to go self-employed because lets face it, most of us don’t do it for the financial rewards, if economic security is top of your agenda, going self-employed in the creative arts is likely to be low on your list of employment choices. This is the list of values to choose from but you are welcome to add your own, they came from Shannah Kennedy’s book: Simplify, Structure, Succeed. Which 3 did you choose? Freedom and Health: being self-employed means I can go for a 2 hour run or a long walk in the middle of the day if I want to, being able to down tools and go outside when the sun is shining has made me far more physically active and the psychological benefits of spending more time outside, in our beautiful British countryside, means I am far less stressed. This also relates to biophilia (see below) which is also supported by working with wool. I also love that I don’t have to get up a silly o’clock in the morning to sit in traffic jams with thousands of other equally miserable people trying to get to the office before 9 am. There’s a lot to be said for home-working! Order/stability : I found working in the corporate world could be incredibly stressful, every 2-3 years we would have a new VP, none of them could ever accept that the systems installed by their predecessor worked just fine and so felt they needed to restructure the entire company in an effort to leave their mark, like dogs peeing on a lamppost. We were constantly working in a state of flux, trying to navigate new processes but never being allowed to do the same thing long enough to get good at it before a new VP would come along and change everything again! I wouldn’t describe my life as particularly ordered; Einstein summed it up well, “If a messy desk reflects a messy mind, of what does and empty desk reflect?”. I am messy and proud! 🙂 But compared to the corporate world my current work-life does feel a lot more stable, my processes only change when I need them to, not because someone else is peeing on my lamppost! Of course, one downside to being a self-employed maker is that many of us feel we have to take the work when it comes, this can lead to working 18 hour days but that is my decision to work long hours (not due to some arbitrary deadline set by a faceless manager) and if I don’t want to work that many hours, I can always refuse a commission or only accept it with an extended delivery deadline. There’s nothing to say you have to take on every piece of work that is offered to you, in fact I think there are some things you should always say no to, but that is a whole other post! Biophilia: Not on the list I know, but I think it is very relevant for most of us. Those of you who make felt on a regular basis will understand the deep connection with nature and the past that it brings, taking natural fibres and thousands-year-old techniques to create beautiful works guided only by your imagination and what the materials want to do. One of the respondents on the FB page also talked about how isolating it can be to be a creative working from home, she described how she has changed from an assertive, confident woman to feeling like a timid mouse. I felt so sad reading that but I can easily relate to where she is coming from. Working on your own, 7 days a week can be tough, even for introverts who are comfortable with their own company, I can only imagine it must be an impossible challenge for extroverts. For me, while designing and making are where I find the most fulfilment in my work, I realise that attending fairs and teaching are what keeps me sane. I need that social interaction, while Pickle (my cat) is very chatty, his conversation is hardly what anyone would think of as intelligent. If you mostly work alone, how do you find it? Do you have strategies for coping with the isolation? I think we are social animals (even the introverts! ), we need to connect with other humans and for me, I am finding I need to collaborate and share with others, Open Studio events and craft fairs are a great way to connect but are quite sporadic so I was chuffed to bits to spend a day with Janine and Nancy making winged vessels in Janine’s studio (she has a studio to die for!). I am already looking forward to our next play-date and hope this will become a regular event in our diaries. I have long admired Ruth’s creative textile gatherings and hope we can develop something similar. 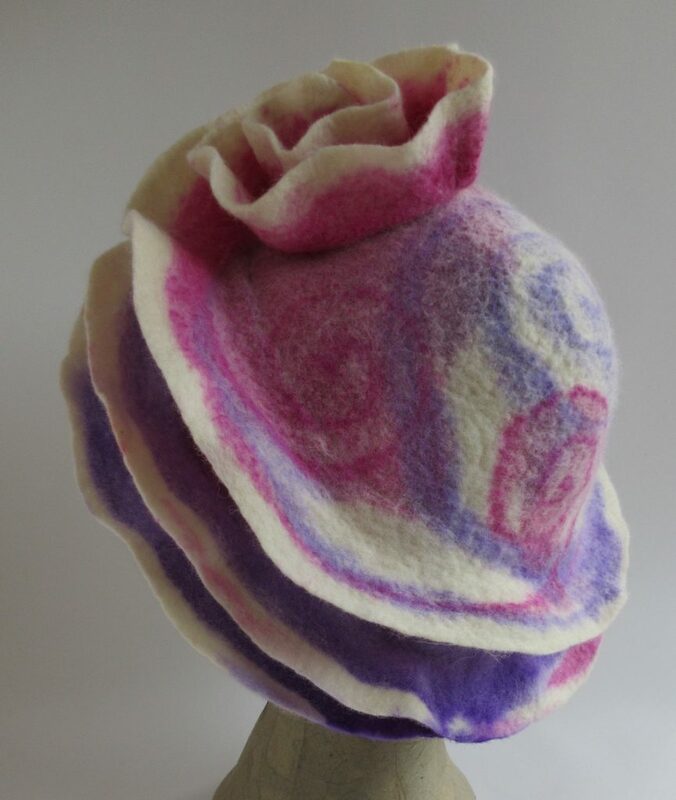 This entry was posted in 3D, Felted Hats, Guest Writer, Wet Felting. Bookmark the permalink. Good for you! I work at home by myself and have no problems being alone all day as I love what I do and felting, weaving and knitting are solitary endeavors but do like to converse with others in my field and take classes when I can. Being aware of your comfort zone is helpful and being fulfilled by your craft is essential! Your Felt is wonderful! Thank you for your wise words Vitoria, feeling fulfilled by what you do really is at the crux of all this isn’t it? Janine is a serial workshop attendee, even though she is one of the most experienced and knowledgeable felt-makers I know, I think it is the social aspect combined with focussing so intently on a technique or finished product that is the attraction of workshops. I wish I had more time and money (don’t we all?!) to attend more workshops. Great post. I am afraid I fell in to felting they way I have fallen in to most things in my life. You do need to stop when what you have fallen into is the muck though. Sometimes thats hare d to do. I enjoy working alone but connecting with other is important to me. My guild has given me much of that. I love to be involved but hate to be in charge as a rule. I do love teaching, and yes I fell into that too. You must do a post about how you dyed your lovely hat. Did you “paint” it? The dyeing process for the hat is quite simple really, I soaked the hat in acid water (3g citric acid per litre warm water), squeezed out as much water as I could, then painted on the acid fast dyes, dropped it into a plastic bag and steamed for an hour. Then rinsed once cooled. The colours do tend to run and bleed a little with this technique, if you want sharper lines / edges Ruth covers various printing techniques in her screen-printing class that will achieve that effect. Great post Teri! Good for you for being brave and doing what makes you happy. It is hard work but as you say, it is because you want to that you do it, not because someone else tells you that’s the way to do it, when to do it and how long to do it. I hope that your group works out. Even if you only start with a couple of people, that works. Getting too big a group often becomes cumbersome anyways. Just set up a schedule that works for everyone, decide what the plan is and do it. You have a group 🙂 We take a couple of months off in the summertime but otherwise meet once a month. We plan everything a year in advance, we do change plans but most of the time the planning works great. Your hat is wonderful and I love the dyeing process. The spiral design fits so well with the hat design. I am impressed that you plan your meetings a year in advance, so far we only plan for the next meeting and that has worked well. Your hat is so delicately pretty! Great post, thank you Teri. Our three would be creativity, health and freedom. 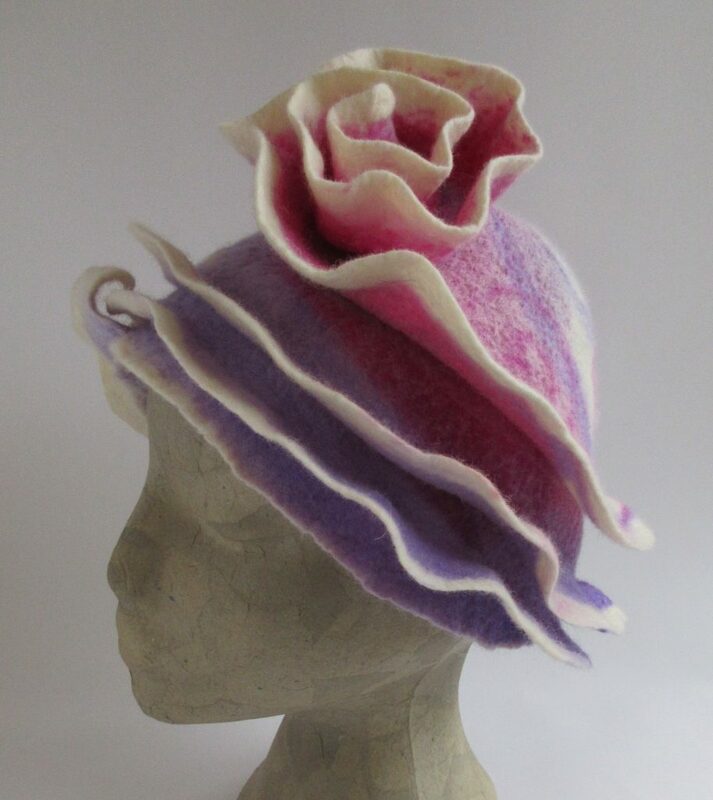 Thank you ladies, this hat is quite a departure from my usual bright colours isn’t it, but I love it all the same. Great post Teri! My story started before a career with sewing and papermaking, then again after it retired from corporate with felting. The best part of being involved in the creative community is the lifelong friends you make along the way. I’m so glad you made the decision and are living the dream! I have no doubt you’ll find a way. Running will hopefully keep you in good health. Go whirl! 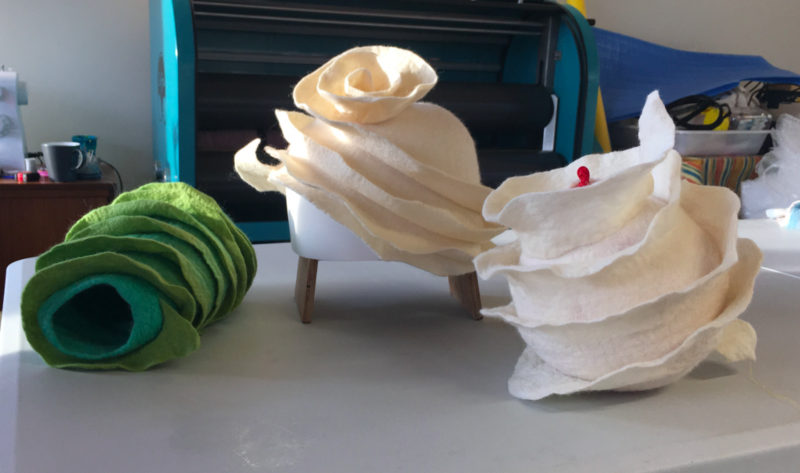 Great thoughtful post Teri and I love the items the three of you made – very sculptural. Thank you for sharing your lovely finished hat. I mostly enjoy company. At one time in my career (which was 30% creative) I spent 5 days/week alone unless I attended meetings….there was no one to bounce ideas off, or to provide ‘presence’….I found that almost soul destroying. 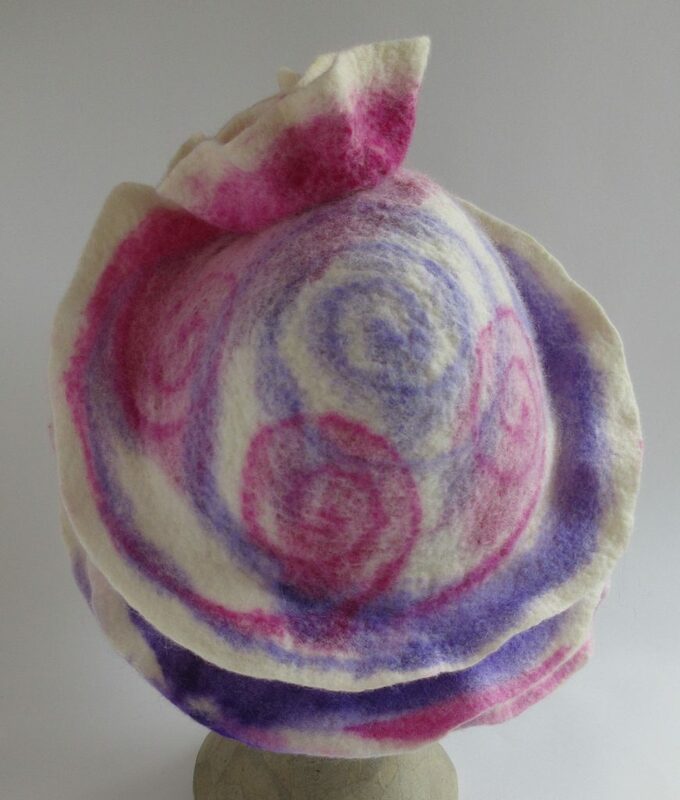 Retired now, I certainly find attending felting workshops (pocket permitting!) aids the creative flow….there is only so much input my EPH can give! However I’m fortunate that I belong to a local textile group meeting once per month with different guest tutors on a variety of subjects….sometimes these feed into my work. I’d choose Health, Self respect, and Personal development (I think the last two both necessary after retirement). I’d also sneak in Wisdom because I love discovering and understanding different things – anything from new techniques to the world at large. Thank you Antje, you make an excellent point, our best ideas often come / developed when we have other people to bounce them off. Workshops are great for that but as you say they are rarely free.